Blend out grey and lift up to 4 levels. 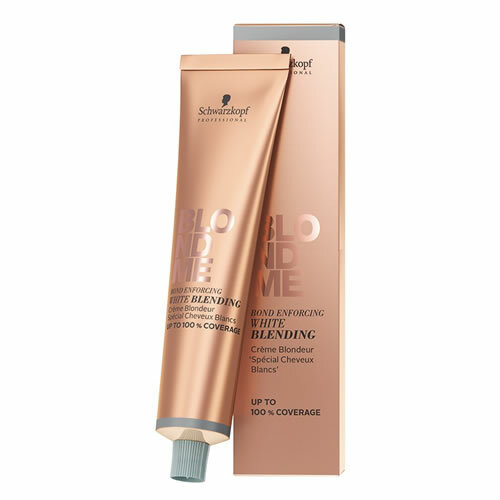 Schwarzkopf BLONDME Bond Enforcing White Blending creams are designed for lifting and white blending while looking after the hair too. They're formulated with Schwarzkopf's Integrated Bond Enforcing Technology which uses succinic acid to penetrate the hair during blonding and protect those all important hair bonds. The result is blonde hair which keeps its strength and elasticity making it less prone to breakage. Ice—cool tone with anti-yellowing effect. Mix in equal parts (1:1) with Schwarzkopf BLONDME Premium Developer. Processing time is 15–30 minutes. Comes in a 60-ml tube. 2 shades of lightening additive for lightening and toning in one step. Gives up to 8 levels of lift when mixed with BLONDME Bond Enforcing Premium Lightener 9+. 7 shades of pastel blonde toners that can be mixed to create bespoke tones and are made with Integrated Bond Enforcing Technology to protect hair bonds for beautifully conditioned results. Also limited stock remaining of Apricot in the old BLONDME Blonde Toning Cream - reduced to clear! 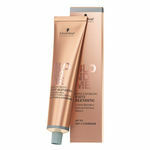 Caring oil developer that's optimised to work with BLONDME bleach and colour, giving superb lift and hair care in one. Comes in a 1-litre bottle in 4 strengths: 2% (7 vol), 6% (20 vol), 9% (30 vol) or 12% (40 vol). Black, plastic tinting paddle with a rounded grip for comfort and comb teeth in a rounded profile for precision colouring and highlighting. Measures 10-cm wide x 22.5-cm long. Whether you go for classic Black or gorgeous Purple this tint bowl has a non-slip base and a secure rubber grip. Graduated up to 360 ml (12 fl oz). I received these clippers today and haven't been able to put them down.. they take a little getting used to when first used but when you get used to them the power is fantastic the blade is fantastic and they fade like a dream defiantly a 5* clipper and a 5* buy..